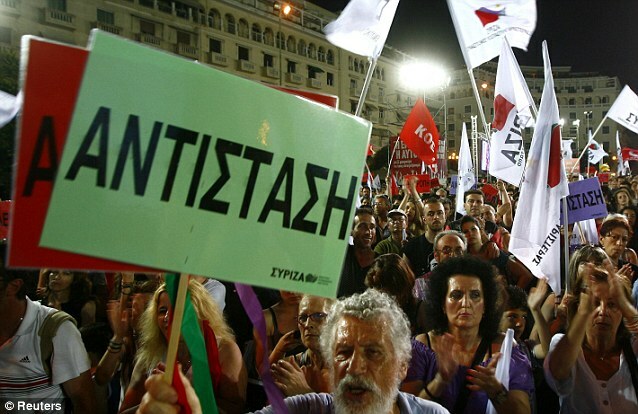 Today's vote has been dubbed "the financial equivalent of the Cuban missile crisis"
European leaders yesterday piled pressure on Greek voters to reject Left-wing parties threatening to rip up the country’s bailout deal – a move that could leave the euro on the brink of collapse. On the eve of today’s knife-edge vote, dubbed ‘the financial equivalent of the Cuban missile crisis’, German Chancellor Angela Merkel said the punishing terms of Greece’s 108 billion bailout package were not negotiable. Her intervention came amid growing fears that Greece’s Left-wing Syriza group, which has promised to tear up the deal, could win the vote or at least deny pro-austerity parties overall control, causing a run on eurozone banks. A Greek withdrawal from the single currency would unbalance the social and political stability of Europe and the effects would be felt in Britain because the eurozone is a major trading partner. It could also lead to a surge in illegal migration as people flee soaring inflation. But while damaging, the effects on the UK would be softened by contingency planning that has been under way in the Treasury and the City for more than a year. Most banks and major financial institutions have ‘priced in’ a Greek exit by writing down investments linked to the country and building up their cash buffers. The deepening crisis will dominate this week’s G20 meeting of world leaders in Mexico, to which David Cameron will fly just hours after voting closes in Greece tonight. Robert Zoellick, the outgoing head of the World Bank, is expected to warn leaders at the G20 to steel themselves for a Lehman-style global crisis, should the Greek electorate choose an anti-austerity government. Referring to the bankruptcy of Lehman Brothers in 2008, which triggered the deepest slump in the global economy since the 1930s, Mr Zoellick also warned developing countries to "prepare for the uncertainty coming out of the eurozone and the wider financial markets." 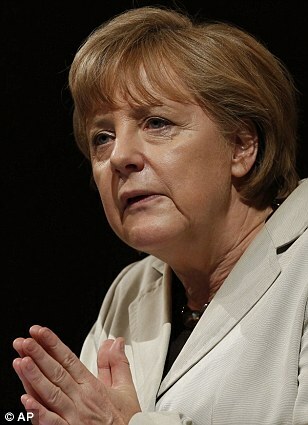 Meanwhile, Mrs Merkel warned that countries such as Greece had to abide by their deals. The German chancellor added that Athens will not be allowed to dodge its austerity agreement and ‘lead everyone else through the arena by the nose-ring’. The election battle is between the anti-austerity Syriza party led by Alexis Tsipras, 37, and his opponent on the right, Antonis Samaras, 61. Latest opinion polls gave New Democracy leader Mr Samaras, who wants to keep Greece in the euro, a slight lead but many commentators were describing the outcome as too close to call – while some even predicted a shock win for Syriza. If Mr Tsipras does succeed, panic is guaranteed across the financial markets, as he has repeatedly said he will reject the terms of Greece’s bailout. 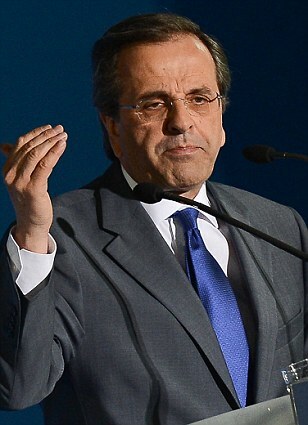 That will likely lead to the country pulling out of the single European currency and returning to the drachma, which Mr Samaras says will create an even greater economic meltdown and unleash contagion in other fragile European economies. The dangers to Britain lie in the unpredictable knock-on effects which are hard to forecast, simply because a currency union on the scale of the euro has never ruptured before. If panic spread across the region, and depositors in Spanish, Portuguese, Italian and even French banks rushed to move their euros into German banks, the effects would be immensely destabilising. UK banks, heavily exposed to their French rivals, could be drained of vital credit and need emergency funds. The markets would be spooked, businesses would pull back on investment and yet more job cuts in Britain’s financial sector would be likely. Half of all UK exports go to the eurozone, so the chaos would hammer demand for our products and put weak businesses in peril. Pension funds would also be hit by market volatility, with investors choosing low-income ‘safe haven’ assets. Mr Tsipras has promised Greek voters he will restore growth by reversing the tough austerity measures imposed by the bailout package and which have hit many Greeks hard. Engineering student Elias Panteleakos, 22, said yesterday he would vote for Mr Tsipras and added: ‘The worst scenario for Greece is for the government to continue with these austerity measures. Yesterday the streets of Athens were calm but extra security has been drafted in. Groups of police, some in body armour, stood on street corners and outside shops in case of disturbances. The main shopping street was busy but most customers were tourists, many forced to pay with credit cards because working cashpoints are rare. 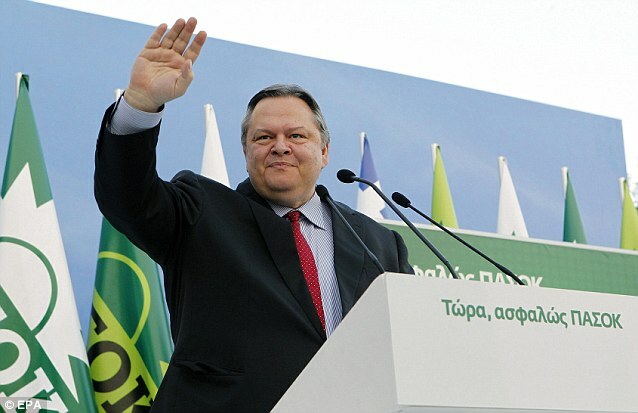 Greeks are withdrawing between 500 million and 800 million euros a day and hiding them abroad. Experts said stock markets could crash after the election and there could be a financial crisis similar to that which followed the 2008 downfall of Lehman Brothers in the US, forcing governments to intervene to prevent a banking collapse. An official projection of the result is expected after polls close at 9pm tonight, with definitive results announced early on Monday. Voting in parliamentary elections is compulsory in Greece. When I was staying with my sister Lydia in Athens a month ago, she and her friends were busy putting leftover food in Tupperware boxes. They then took them to families in the Voula suburb so they could feed their children. A year ago, the organisation my sister helps was feeding 15 people a week – nearly all of them from homeless, immigrant families. Now that number is 80, and half of them are Greeks. It is another sign of how desperate things have become there. With just two per cent of Europe’s GDP, Greece is a tiny country. 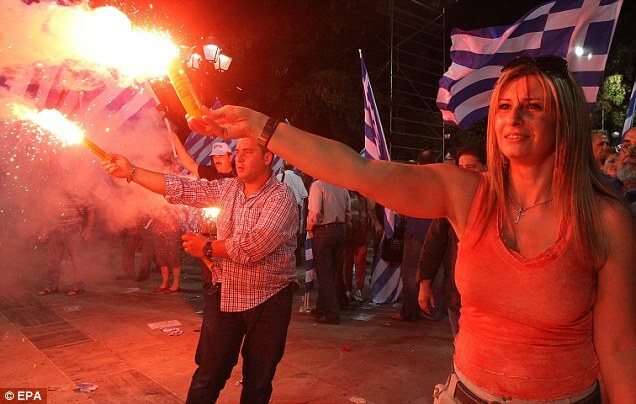 But right now, the Greeks are holding the future of the eurozone in their hands. Today’s election – the second attempt to vote in a government to steer Greece towards reform and recovery – has been one of the most talked about events in the world. In the UK, the Government has made huge quantities of extra liquidity available to the banking system, in case the markets panic should the results suggest Greece will exit the eurozone. This would have severe repercussions for the European banking sector, and possibly lead to a credit crunch of the type seen after the collapse of Lehman Brothers in 2008. The Spanish banking system is already on its knees, and there are fears of contagion in Italy and possibly France. German banks are being downgraded due to the expectation that eurozone growth will suffer substantially from a Greek exit. So that is why the Greek candidates are household names across Europe. There’s the US-educated Samaras from the Right-wing New Democracy party; Venizelos, an ex-finance minister of the socialist Pasok party, which had to go cap in hand to the IMF and its European partners to get Greece’s first bailout; and Tsipras, the charismatic young leader of the new radical-Left Syriza party, who rose from nowhere and originally pledged to tear up the bailout agreement. Tsipras now says he will just renegotiate it. He promises freedom from corrupt politicians, and growth and jobs for everyone. Since the inconclusive election on May 6, the nation has been holding its breath to see what’ll happen next. The political leaders have been interviewed in the wonderful sunshine, and discussions are calm and composed. But storm clouds have been gathering – and may break tonight, when the exit polls are announced then the markets open in the Far East. The apparent calm has been hiding the despair of many people who have lost their livelihoods and are suffering a fifth year of declining living standards. Businesses are going bust at an alarming pace, unemployment is above 20 per cent – 50 per cent for 18 to 24-year-olds – and the suicide rate is soaring. Basic services are paralysed, and medicines are scarce, with huge queues at pharmacies. Retail sales have plummeted, and many theatres and nightclubs are only opening at weekends. People are driving a lot less, with petrol prices even higher than in the UK. Many parked cars have no plates – to avoid road-tax. There is real poverty, and not just among the immigrant population that tends to use Greece as the point of entry into Europe. I recently saw a notification that free food is being distributed at 103 locations in greater Athens, and 13 in nearby Piraeus. The election should be seen as a play of two parts. The first part was in early May, when the Greeks voiced their objection to the two-party establishment – and the pain its policies had brought to the people – by simply voting against it. The second part is today – when they’ll voice what they want instead. During the interval, they started to sober up. Opinion polls showed they wanted a coalition or unity government to take the country through a transition period. In that time, the political system would reinvent itself and deal with the national realities. Those realities are sinking in fast. The reaction from Europe to the inconclusive result of the first election – with stock markets crashing, the euro weakening and talk of a possible forced Greek exit – have sobered the mood. It’s also become increasingly clear that some of the Syriza’s pledges are absurd, such as financing the public sector from people’s bank-savings. It is also calling for Greece to remain in the euro – without austerity measures. The majority of the Greeks do want to stay in the euro. They never saw their vote as ‘staying or exiting’ the single currency. Last week, whatever money was left in Greek bank accounts and had not been moved abroad (a lot was invested in prime London properties), was being withdrawn in a panic and kept under mattresses – as the prospect of a return to the drachma and capital controls were discussed openly for the first time. Arguably the Greeks should not have rushed to elections so soon after the previous prime minister, and former chief banker, Papademos, had negotiated the second bailout. It would have been much better to have done what the Italians are doing. There, elections will not be held until next year, to allow for the measures Mario Monti is pushing through to be implemented. In Greece there has been no effective government for months. And whatever happens today, the Greek fundamentals will not change overnight. After joining the euro by fiddling its figures (in the full knowledge of its European partners), Greece did not invest in productive capacity, and lost competitiveness. The public sector grew to vast proportions, with many workers being recruited as political favours. Corruption became endemic, tax avoidance and evasion the norm and public spending span out of control. So when the crisis hit, Greece had nothing to fall back on. It is anyone’s guess what will happen today, as no official polls have been allowed for two weeks. Unofficial polls by betting firms show New Democracy and Syriza are neck and neck. My hunch is that the Right-wing New Democracy party, which led Greece through the period when a boom disguised the underlying problems, will win – just. It would then receive an extra 50 seats, due to the peculiarities of the system, and form a coalition with the socialist Pasok. Whatever happens, the new government will have to renegotiate the bailout agreement, as the targets given to them by the IMF are too stretching. And Greece will probably stay in the euro, as the cost to Europe would be more than if it stayed. Yes, there’ll be further defaults. But as long as Greece can demonstrate it is prepared to reform, the money will come in. The alternative is too frightening. If Greece leaves, the markets will assume it is just the start, and other countries will follow. That would be the end of the ‘euro project’. And Europe has realised that Greece’s problems are not unique, and that the fundamental flaws of a poorly thought-out project must be fixed – rather than expelling naughty members when they misbehave to frighten the others into submission. Will the Greek Public believe the lie that 20 years of austerity is better than sending a load of banks to the wall in mostly other countries at that? Hopefully, we won't get an "Iranian" style election result here, having been thus engineered by the banking community in cahoots with the incumbent governments. I placed a bet at 11-4 that Syriza win... They are slightly behind in the polls but their base is motivated while New Democracy voters are reluctant. The most committed usually wins, if the turnout is low that will be a strong indicator that ND voters stayed home. Talk about the Greek Tail wagging the Euro dog ! The sooner this is sorted once and for all,the better we will all be. How many of our silly bankers got big bonuses for putting money there? Greece are being bullied into an austerity package that they can't keep. All this scare mongering these leaders are doing about Greece if it leaves the eu is ridiculous. they only say it for their own benefit. That's what is making the markets worse. It doesn't have to be worse than what greece are going through now. Greece would be better off out of the eu, they can then build up their country again and start promoting their tourism trade on a more stabe basis. If the eu was broken up rather than this super Europe state that Germany are fighting for (probably because they would be running it) is going to ruin this country and many more . And to say it would affect trade here, why, if we have goods that other countries want we can still trade just as we did before. I hope Greece do decide enough is enough and they leave the eu because it will lead the way for several other countries to follow suit and maybe this government will be forced to give us a referendum at last. 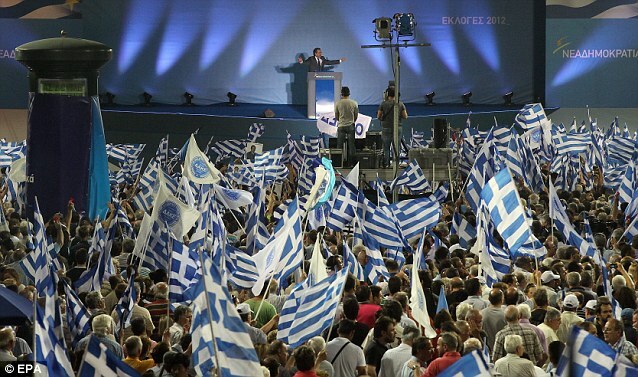 Go for it Greece, free yourselves from the tirrany of the nightmare known as the E.U. if you dont do it now you will be forever the slaves of the German high command. Break free and your bravery will help the rest of us who do not want any part of it to break free too. All this talk of economies faultering and going into meltdown is nothing more than scaremongering tactics by the 1% that want to keep us shackled with no voice and no democracy. I wish you all good luck and i pray you will vote the way were all hoping you will vote. Listen to Merkal and the likes, and your lives will be contemptuous misery for ever. "A Greek pullout from the single currency would unbalance the social and stability of Europe" . What stability? We keep hearing how the markets are going down and further down, the loans to bailout banks to try to get stability, how thousands of people are losing their jobs across Europe etc. what planet are these people on exactly. 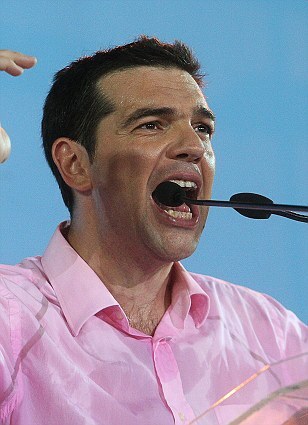 Everyone knows Greek can't uphold the austerity package that Germany wants so the only other option is to leave the eu. All these so called expert leaders who keep saying how it is going to have a catastrophic effect on all the other countries in the eu are just scare mongering to get their own way. It doesn't have to have a bad effect at all, that's if these countries don't want it to. It seems like Greece are in a pretty catastrophic place now and if they stay part of the eu it will be even worse for many years to come because they are being forced by Germany to accept an austerity package that they can't keep. It's all going according to plan. David Icke warned us of this years ago. The first sentence of this article says it all.They now use fear to conserve their untenable positions. These "European leaders" who in collaboration with the banks,the IMF, the speculators of the markets, caused and perpetuated this whole mess in the first place, and incidentally got very fat in the process, "PILE PRESSURE ON GREEK VOTERS" to elect New Democracy or any other party who will continue to impose austerity. These same "European leaders" who have no concept of the reality of austerity but theorise on the measures over one or more of their innumerable banquets at their endless stream of "crisis meetings". Their time would be better employed discussing austerity while standing in the queue waiting for a handout at one of the numerous soup kitchens in Athens. I sincerely hope that the Greek voters tell these "European leaders" that "enough is enough, austerity is the price of your incompetence and self interests", and elect Syria. Best thing for the UK & Greece is to pull out of the euro now. For Greece start collecting taxes, close your borders and build your own economy again. UK likewise on borders, and economy. If the whole country stopped buying Chinese and bought UK products, employment and growth would follow. Bank bailouts, political upheavals, spiking bond yields and falling stock markets: the troubling headlines from Europe just keep on coming. The details are as changeable as the euro-dollar exchange rate. Despite the announcement of a 100 billion euro bailout for Spanish banks last weekend, Spanish bond yields soared to new heights, a sign of worsening trouble. On Sunday, Greek voters are likely to voice disapproval of the fiscal austerity measures required for their country's bailout. This week, the eurozone's problems are expected to be a focus of the G-20 meeting in Mexico. But if there's one constant, it's that Europe has been in a long-running crisis. And with great consistency, many investors have responded to this dismal drumroll by pulling their money out of European stock markets in search of safer assets, or those that seem so, with U.S. Treasuries near the top of the list. That's why the latest advice from Litman Gregory Asset Management, a financial services firm based in Orinda, Calif., is so startling: It may actually be time to start increasing investments in Europe. "We think the markets have gotten ahead of themselves," Jeremy DeGroot, chief investment officer at Litman Gregory, said in a telephone conversation last week. "They've priced in so many problems for Europe that, on a relative basis, European stocks look very attractive for long-term investors." "Relative" and "long-term" are the operative words here. Despite Litman Gregory's contrarian approach, DeGroot makes it clear he isn't sanguine about Europe's immediate prospects. "I don't think we have a more optimistic view on that than the market consensus," he said. In his view, neither the bailout of Spanish banks nor the Greek election is likely to resolve the problems of the eurozone. In the weeks ahead, he adds, volatility is quite likely to flare up again. And so we may well see a resumption of the flight to safety that has battered global equity markets and brought Treasury yields to extraordinarily low levels. Furthermore, in a period of weakness for Europe, the euro could well weaken further against the dollar, elevating the risk for investors in foreign stocks. "We're really not very bullish on Europe for the short term," DeGroot said, adding that he was emphatically not urging investors to take a quick, deep plunge into the market in the hope of immediate gains. But despite those caveats, he does see a compelling case for investors with at least a five-year time horizon to raise their exposure to European equities. In a model portfolio for American mutual fund investors with a middle-of-the-road approach to risk - a "balanced" portfolio with 60 percent of assets typically allocated to stocks and 40 percent to fixed-income holdings - the firm suggests increasing exposure to European and other foreign stocks by a modest 6 percentage points. That would include 2 percentage points allocated specifically to an exchange-traded fund devoted entirely to Europe. And it would reduce investments in investment-grade and emerging-market bonds and in large-capitalization U.S. stocks by an equivalent six points. The firm expects emerging-market economies to grow faster than those in developed countries, so it advocates increasing emerging-market investments, DeGroot said. But the main reason for ratcheting European exposure upward is less about Europe's potential than its prices: Its stocks have become more attractive precisely because they have been beaten down so badly. "The uncertainty stemming from Europe has led its equity markets to cheapen relative to the U.S. equity market to the extent that we believe Europe now presents an attractive tactical opportunity," the firm said in a note to subscribers of its No-Load Fund Analyst newsletter. Over the past 12 months, for example, the CAC 40 stock index in France lost more than 24 percent, dividends included, when converted into dollars, while the IBEX, which tracks Spanish stocks, lost more than 36 percent, according to Bloomberg data. That compared with a total return of 8.5 percent for the Standard & Poor's 500. Principally because of the lowered prices in Europe, Litman Gregory projects that the overall European stock market is likely to have a "low double-digit return," annualized, over the next five years, compared with a 5 percent return in the U.S. stock market. These are only rough estimates, of course, and, given the downturns in recent years, they may seem overly optimistic. "We don't want to give the impression of false precision," DeGroot says. But he says the data certainly suggests that, relatively speaking, the overall European stock market is now cheaper than that of the U.S. This is actually a widely held view, according to a BofA Merrill Lynch Global Research survey, conducted from May 31 to June 7 and involving 260 fund managers. Europe is the most undervalued region in the world, managers said in that survey - but the question is what should be done about it. With the European crisis still very much unresolved, these managers have generally been shunning the eurozone's stock markets, a move that may have shielded them from even greater losses. Dividend paying stocks have been overlooked for too long - it's time to give them their due. During the dot-com boom of the late 1990s, tech companies like Apple ( AAPL , quote ), Microsoft ( MSFT , quote ) and Intel ( INTC , quote ) did not pay dividends. Their boards of directors felt that their billions in cash were better spent on research and acquisitions than on rewarding shareholders. Dividends are important to the total return of a stock though. According to Vanguard mutual fund founder John Neff, the income component of an equity provides more than 40% of the total return. Since 2000, dividends have been even more important. The stock markets have been flat, and dividend paying stocks have provided the only positive return. At present, the average dividend on the Standard & Poor's 500 Index is around 2%. For an Asian stock, the average dividend paying stock yields around 3%. The historical average payout ratio -- the funds left over from earnings after paying a dividend -- for a member of the S&P 500 has been around 50%. The payout ratio says a great deal about the management of dividend paying stocks. According to investment manager Jesper Medigan, a dividend payout ratio of around 40% shows that company management respects the rights of minority shareholders. Medigan also says that when Chinese companies have been found to be fraudulent , not a single one had paid a dividend. An income stream is good proof of its overall health - a company can't fake a dividend check. Dividend paying stocks are particularly attractive when interest rates are low. The Wall Street Journal says that investors have gotten the lion's share of their returns from dividend yields , not dividend growth or capital gains. This is also true for the shareholders of Microsoft, Apple and Intel. All three companies pay an above average dividend now. Value manager John Buckingham (CIO, Al Frank Asset Management) says dividend paying stocks are the best bet for a tentative market. While Greece has a small economy, worth just 172.9billion, a disorderly default and an exit from the euro could have big consequences around the world. Thursdays Mansion House speeches by Chancellor George Osborne and Sir Mervyn King, governor of the Bank of England, show how they fear the eurozone storm. This week the BoE will begin offering UK banks 5billion a month of cheap funding to help them survive problems caused by the eurozone. Sir Mervyn also hinted that central banks in the US, UK and Japan could take co-ordinated action to flood the markets with billions in cheap finance to stop the global economy seizing up and keep banks afloat. For Britain, hopes of a trade-led recovery have long passed because of the EUs troubles. Our trade deficit jumped last week, in part due to a 6.8 per cent fall in exports to Europe. If a large eurozone economy is engulfed, the Office for Budget Responsibility says it could lead to two full years of recession in Britain, shrinking the economy by 1.9 per cent in 2012-13 and 0.2 per cent in 2013-14. A Greek euro exit could also mean a further 121billion loss on money loaned and pledged to finance the euro, the Bruges Group think-tank has said. The resulting collapse in market confidence would send share prices plummeting around the world, hitting pension pots and savings. Billy Burrows, of the Better Retirement Group, said anyone buying a 100,000 pension annuity will get 10 per cent less for their money than a year ago because of falling gilt yields. A Greek exit could also lead to a run on European banks, especially in Portugal, Italy and Spain, where the banks received a 100billion euro bailout only last week. If no party wins today, coalition talks could drag on for weeks, destabilising markets and forcing central banks to pump billions into the banking sector to stop a new credit crunch. With so much riding on such a small state, the outcome of todays elections in Greece will be watched nervously around the world. McALLEN, Texas -- When it comes to arresting drug traffickers and dismantling organized crime, the investigation into a U.S. horse racing operation allegedly laundering money for one of Mexico's most powerful cartels is rare - and difficult to prosecute. Unlike most drug busts, the backbone of sophisticated money laundering cases is a complicated trail of paper - reams of bank, tax and property records - that usually take years to track. But hitting organized crime where it hurts the most - the money flow - is the most effective way to shut the crime networks down, investigators say. "The money is much more valuable to the trafficker than the drugs are," said John Kirby, a former federal prosecutor in San Diego, who worked on money laundering cases against the Arellano-Felix cartel, among others. "If you want to hurt these guys that's how you do it, because that's the end product. That's what they really want. And if you can try to take that away, then you're really having an impact." During his 10 years in the U.S. Attorney's office, Kirby said he prosecuted hundreds of drug traffickers. "I had eight good money laundering cases. They're just hard." Chasing organized crime's money flow isn't a new tactic. The same racketeering laws being used against Mexican cartels today are the ones that targeted the mafia in the 1970s. Money laundering was spelled out as a federal crime with a 20-year maximum sentence per count in 1986 as law enforcement officials increasingly recognized that just seizing the drugs wasn't enough to bring down traffickers. In this latest case, federal agents raided an Oklahoma ranch, a New Mexico quarter horse race track and sites in Texas on Tuesday, alleging a brother of a leader in the Zetas drug cartel was using a horse-breeding operation to launder money. Millions of dollars went through the operation, which bought, trained, bred and raced quarter horses throughout the southwest United States, the indictment says. Eight people were arrested, including Jose Trevino Morales and his wife in Oklahoma. Two of his brothers and four others remain at large. "That case will be a model, a blueprint for a long time to come of how we need to take on these 21st-century criminal techniques," said Douglas Leff, who was chief of the FBI's Asset Forfeiture and Money Laundering Unit before recently returning to New York. He expects more cases because of a 2010 Mexican banking law that makes it difficult to deposit U.S. dollars into accounts across the border. That means cartels will do more money laundering in the U.S., he says. "If we can follow the money successfully, that's going to be the avenue that leads us to the top of the food chain rather than somebody who's just a trusted manager," said Leff, who spent some time on the case while at headquarters. The government's investigation into the horse operation began in January 2010 with a tip from an informant in Mexico that two Trevinos at the top of the Zetas organization were the real buyers behind two quarter horses that sold for more than $1.1 million at an auction in Oklahoma City, according to court records. The IRS had its own investigation of Jose Trevino, and the investigations merged in February 2011. Usually the drug cash was smuggled back into Mexico and run through currency exchanges for an initial rinsing. Then the Trevino brothers recruited Mexican businessmen to wire payment or write checks for horses bought in the U.S. to make the transactions appear legitimate. They would reimburse them in cash. At other times, workers for the Zetas' Dallas cocaine distributor passed drug cash directly to Jose Trevino - at least once at a Wal-Mart outside Dallas - cutting out the return trip to Mexico, court records say. Stop the debt AND flow free labour laws and south can pay.